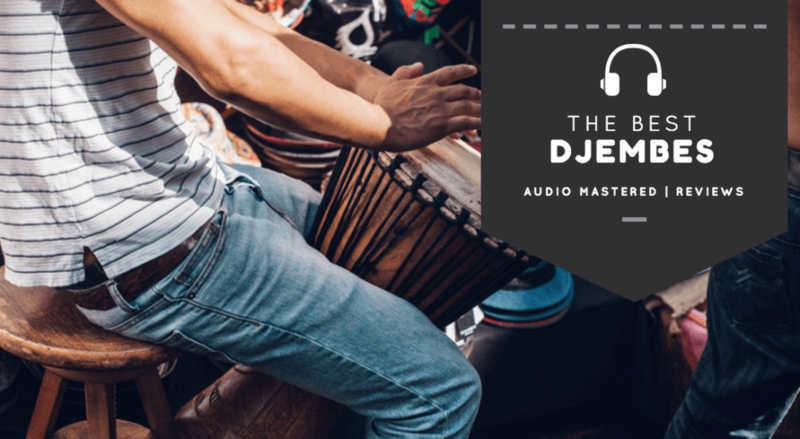 Djembes are a great instrument to bring to a jam or a drum circle. They're portable, durable, beginner friendly, and have a sound loud enough to jam with other acoustic instruments. They are a great instrument when learning percussion and can be a lot of fun for the experienced drummer. If you're willing to pay for it, many companies will make you a custom drum. This is often the advice you'll hear when searching for the best djembe drums in music forums. Although we agree that a custom drum will likely sound better, we believe that you can pick up a great quality drum without spending $300. 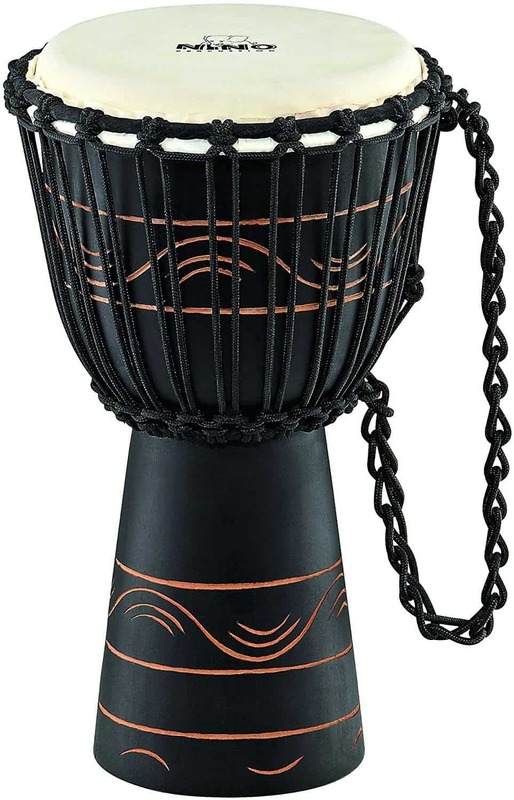 We've spend some time researching​ the best djembe drum and have made our suggestions based on our own experiences, online forums and music websites. We've put together a list of our favourite drums for the beginner, intermediate, and advanced player. We'll first quickly talk a little about djembe drums and what you should be looking for. Hopefully this will give you a little more background information you can use when picking out your drum. 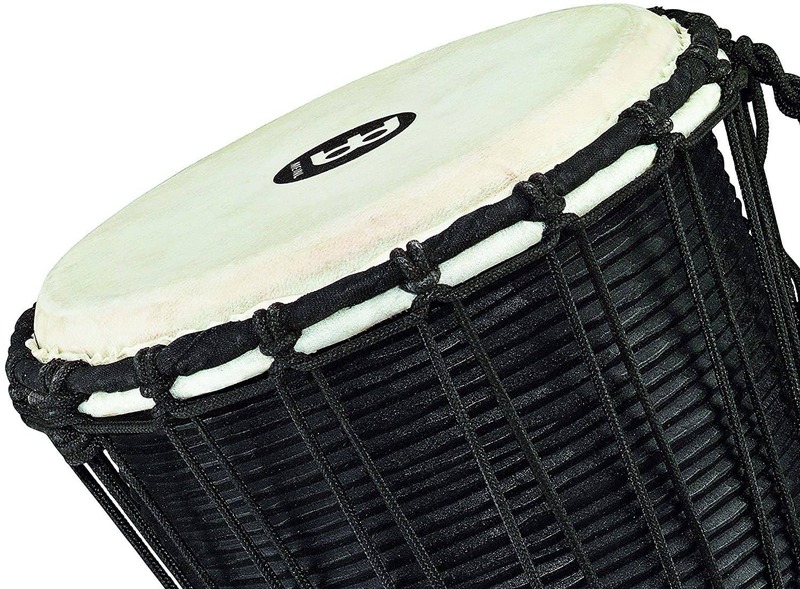 After finishing this article, you should feel confident picking the best djembe drum suited to your needs. Let's get started! As with other handheld instruments, the size of the person will determine the size of the drum. When selecting a djembe, people often look for the smallest, most inexpensive drum. Try to avoid this, as buying a quality drum will go a long way in terms of sound and lifetime. If you're an adult player you'll want to get a drum with at least a 9''-10'' head diameter and 19''-20'' height. This will give you enough room to learn all the different strike locations and techniques. Traditional djembe drums are constructed with a wood body, goat skinned head and are rope tuned. Djembes constructed using tonewoods, such as mahogany or lenke, are known for their warm, rich tones. Nowadays, companies have manufactured djembes using composite material with key tuners. If you are a beginner, we recommend going with the classic wood body with rope tuning. This will give you the authentic look and sound while keeping the price down. If you already have a djembe and are looking for a second, considering picking up a composite material drum as they have a very unique, crisp tone and can easily be tuned. Most djembe drums have goat skin head (either treated or non-treated). Untreated goat skin, while more expensive, will give a wider tonal range with deep bass. These are typically found on higher end djembes. Composite material drums usually come with composite material heads. At times, these can sound more metallic with sharper high ends, but they tend to hold their tune for much longer. The drum you choose should also be based upon your skill level and where you will be using it. If you plan on bringing the drum to campfire jam sessions, having a large djembe is usually a pain to transport. If you stick with a drum head diameter around 10'' you will be able to easily carry it around, and it will also be loud enough to be heard over the other instruments. 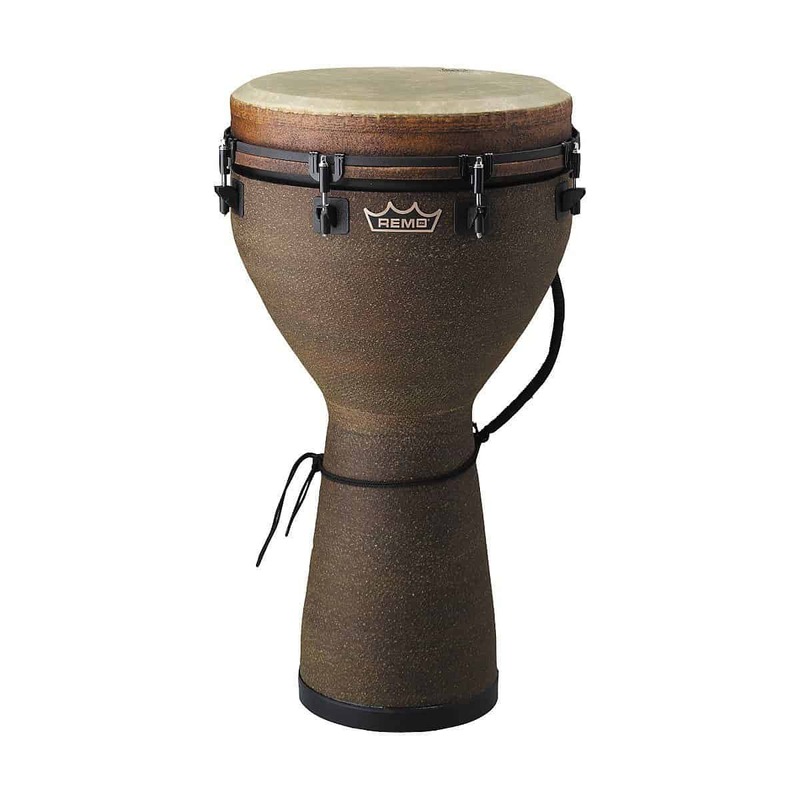 The first djembe we suggest is great for children, or someone with small hands. The second (our favourite) is a great value for the price. It will be a perfect drum for a beginner to intermediate player. The last drum is something different and unique for the djembe enthusiasts. We hope you enjoy! This is a great drum for children or someone with small hands. The size will be small enough for them to manage, while large enough to create a strong sound. If you're an adult, we suggest considering the Meinl Percussion HDJ3-M with it's larger drum head. It's made from a single piece of mahogany tonewood - know for the rich and warm tone. It has a treated goat skin drum head that is tuned using nylon rope. ​Bottom Line: A great entry level drum for children or an adult with small hands. It can also be a great drum for bringing along to outdoor jam sessions! Our top pick. The Meinl HDJ3-M is a great value for the price. It checks off nearly everything on our list of what a djembe needs. It's hand carved from a solid piece of Mahogany wood (know for it's warm tones) so you know it will have deep bass and snappy high ends. It has pre-stretched nylon tuning strings that will ensure your drum stays in tune. The only thing we'd like to add is an un-treated goat skin head. Although, the treated goat skin head will require less tuning, which is great for beginners. From out research It has been very well received on drum forums and on music websites. Additionally, the HDJ3-M is one of the highest rated djembes on Amazon with 120 positive reviews. 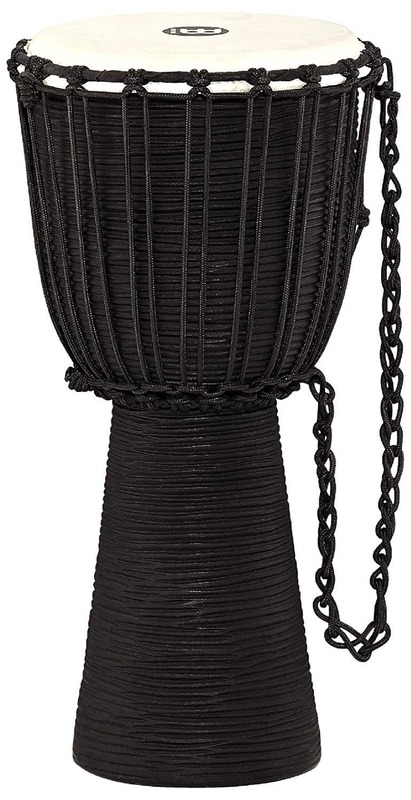 ​Bottom Line: This is a great overall djembe. Perfect for beginners and intermediate level players alike! Highly recommended if you want a classic djembe. Looking for something on the high end of the spectrum? The Mondo line from Remo is made from carbon fibre with synthetic drum heads. This drum has fantastic tones with deep bass and crisp high ends. The key tuners make tuning this drum very easy. Like the HDJ3-M, it is very well received on music forums. Additionally, if you punch a hole through the skin it's easily replaceable (for around $40). This drum is known for having a very sturdy build with fantastic sound. 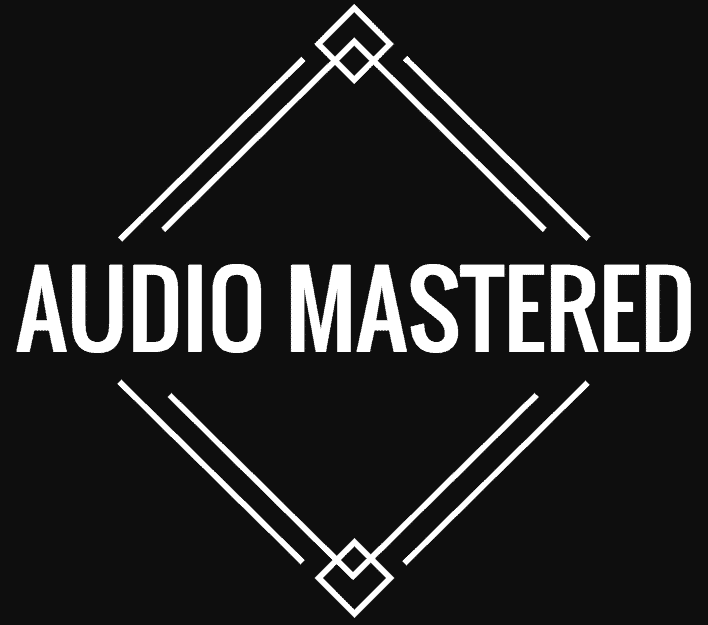 Reviewers have mentioned the large spectrum of sound it is able to produce. The lugs are much thicker than it's competitors and you can change out the drum head if you want to try out a different sound. Bottom Line: Great for experienced percussionists looking for something different that is high quality. You won't be disappointed!